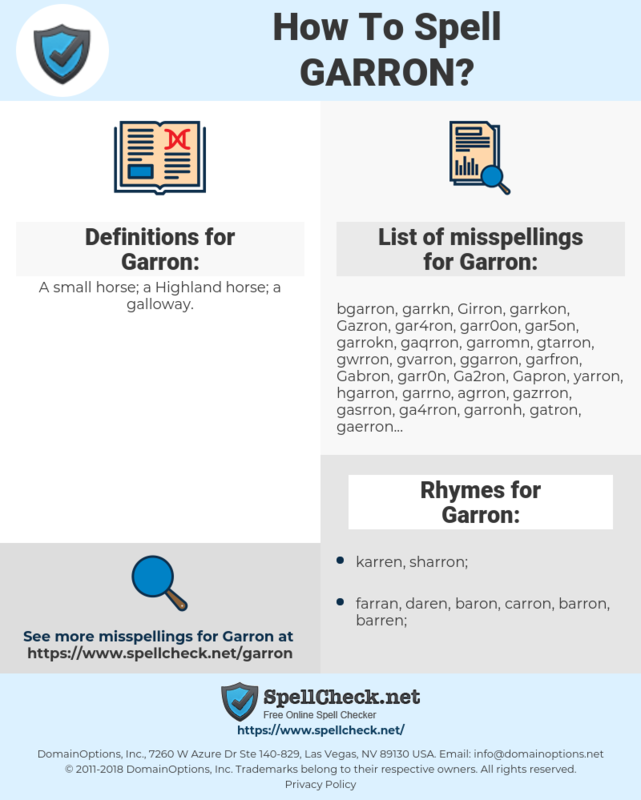 What are the common mistypes for Garron? What is the definition of Garron? What are the usage examples for Garron? What are the rhymes for Garron? What are the translations for Garron? 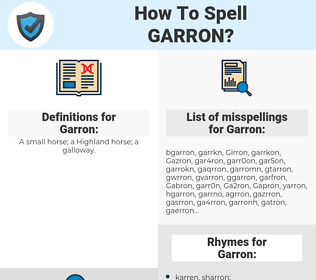 What are the common typos for Garron? A small horse; a Highland horse; a galloway. Garron as a boy's name is pronounced GARE-on. It is of Irish and Gaelic origin, and the meaning of Garron is "gelding". From the Gaelic word "gearran". A garron or garran is a type of horse. The term occurs in Scotland and in Ireland, and generally refers to an undersized and much-despised beast. Also possibly (French) "guardian". Use of Garron and variants listed here are probably the use of family surnames or as rhyming variants following the pattern of Darin variants. This graph shows how "Garron" have occurred between 1800 and 2008 in a corpus of English books.